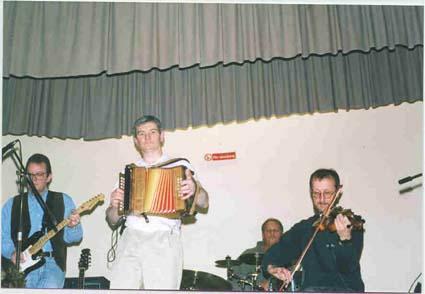 Experienced Ceilidh and Barn Dance Band has been playing together since mid '80's. The band's usual line-up consists of melodeon, fiddle and bass and our resident caller will set your feet a-tapping and your toes a-twitching. The style of music is traditionally based and covers all parts of the United Kingdom. The band perform in and around Sussex, Surrey and Hampshire at fund raising events, weddings, family celebrations and gatherings, and other fun events. And they have played in draughty barns, echoing halls, on the back of a lorry, in open fields and in closed pubs !